Nimrod Long and Associates worked with William Blackstock Architects to create a mixed-use development for USX at the intersection of Stadium Trace Parkway and Brocks Gap Parkway in Hoover, Alabama. 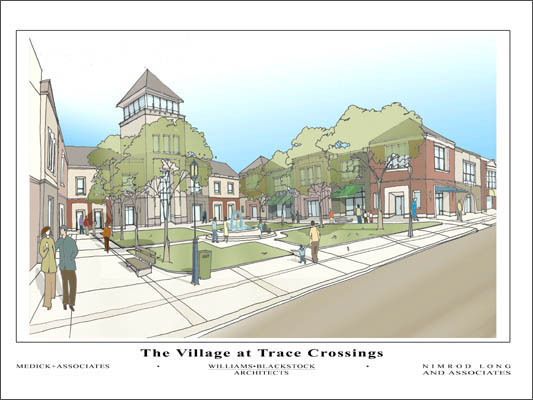 The plan’s focus was to incorporated residential, retail and office uses in a village environment. Brooks Gap Parkway acts as a gateway to the village serving retail and commercial sites. Pedestrian scaled building facades and tree lined sidewalks provide a sense of place. Narrow streets and cross walks were incorporated for traffic safety. Central Plaza and Village Tower make up the village center. The plaza is enclosed on three sides by two-story commercial and retail units open to Main Avenue. Town homes along with live/work units are adjacent to Brooks Gap Parkway facing a large open park.